Texas is the state where I was born and raised and like many people who live there claim, it is almost like its own country. There are so many quirky things that make Texas, Texas (The Alamo, bluebonnets, armadillos, Tejano music, two-stepping, country music, rodeos, Austin). The Lone Star State also has many traditions that date back generations. Personally, one of my favorite traditions involves gold! I remember being in Jr. High School when I started hearing about my classmate's older siblings having high school and college rings. When it came to high school rings, it was only cool to wear them when you were in high school and about one or two years after you graduated. College rings on the other hand, at least in Texas, are acceptable to wear for life. Most always made in gold, college rings in Texas are used to show pride, achievement and loyalty to your school. The Texas University that is most famous for their gold college ring tradition has to be Texas A&M University in College Station, Texas. Texas A&M students or "Aggies" as they called, have a ton of traditions that are just as important to them as their majors. 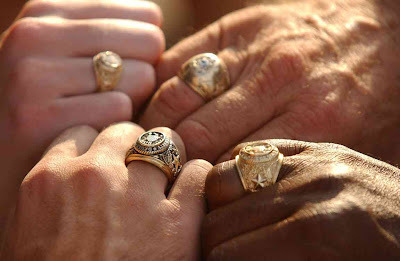 The most visible tradition among seniors and former students is the wearing of the Aggie Ring, whose design has been relatively unchanged since the tradition started in 1894. Since I am not an Aggie myself I asked a few of my Aggie friends to tell me about their cherished gold Aggie rings and what it means to them. 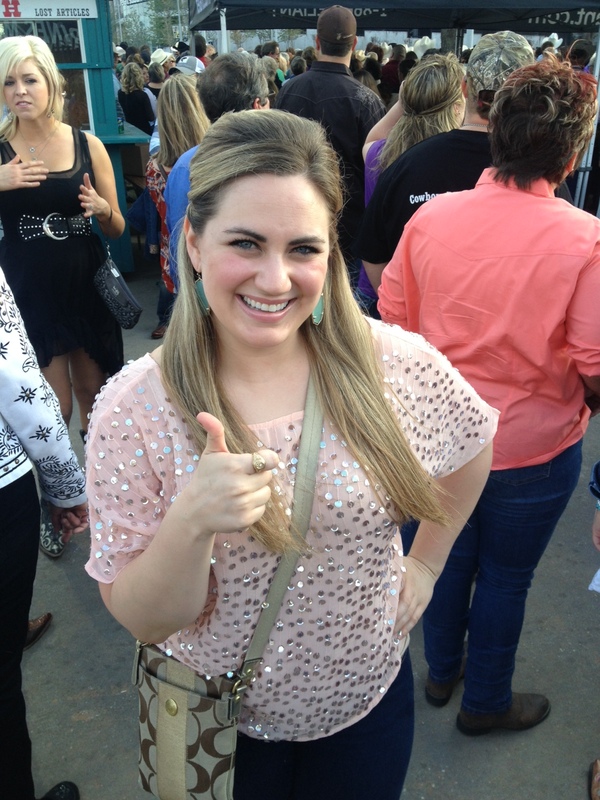 Aggie Brittany Price shows off her gold Aggie Ring. OJ&B: Why did you choose gold for your Aggie Ring? Brittany Price: I chose gold because that's the tradition. We work very hard to earn this ring and although it's now available in white gold, I chose traditional yellow gold because that's what the original ring was made of. That is the tradition. It shows that hard work pays off and it's a conversation piece that serves as an open invitation to all other Aggies. The ring is how we keep our Aggie family connected no matter the time or place. Katie Bowman accessorises with her Aggie Ring. Katie Bowman: I chose gold because its more traditional and more my style. I wanted a gold Aggie Ring because of the tradition and everything it resembles as far as my accomplishments and hard work getting a college degree. I tend to like gold a lot more than other precious metals. Texas A&M might be the University in Texas that has the richest history with their college rings but they are definitely not the only school that has them. My alma mater Texas State University also has beautiful gold rings. I was very excited to get a college ring for many of the same reasons Brittany and Katie stated regarding their Aggie Rings. In Texas people see the rings and know that you achieved something. 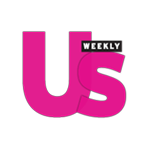 It is a great icebreaker for people to talk to you as well as a wonderful networking tool. There are many stories of people going to job interviews and getting hired because the employer saw their college ring and found out the the candidate is an alumni of the same school. 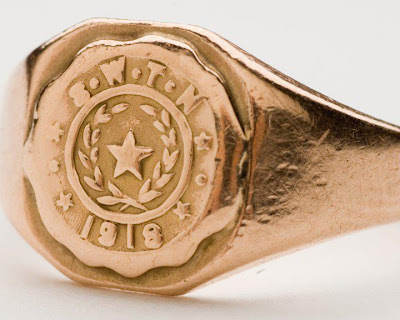 A Texas State University Ring dating back to 1918 via Texas State University's website. When I moved to New York I wore my college ring all of the time (I still do). It is a little piece of home that I can wear everyday and that really puts a special touch to any outfit. The funny thing is that in NYC people love the ring but think I am wearing it as a fashion statement or cocktail ring if you will. When I tell them the story they are always intrigued and just like in the south it is a great icebreaker for people to talk start a conversation with me. My Texas State ring was an amazing purchase in 2009 especially since gold is so hot right now. If you want to make a statement, there is nothing like a gold statement ring. It is even better when the ring has history and nothing holds history better than gold.